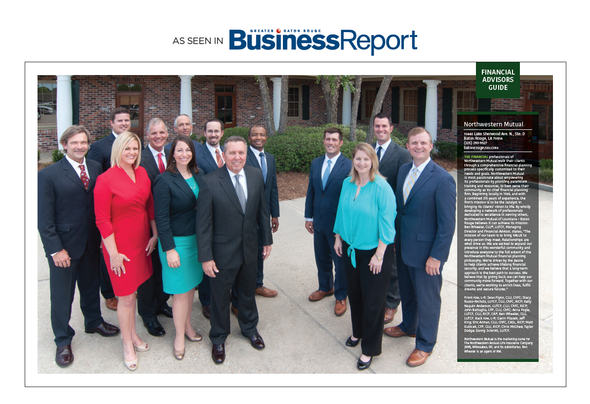 John was recently featured in the Baton Rouge Business Report's Financial Advisors Guide. To read the full article, click here. It is John Battaglia's commitment and belief that who he is as a Wealth Management Advisor has a substantial impact on the level of service and quality of the financial counsel John provides to clients. By taking a comprehensive assessment of your current situation, helping you prioritize your goals, and developing a workable strategy with clear action steps and timetables, John Battaglia will do his best to help you protect and provide for those people you care about most. John will work hard to build a relationship with you based on trust and integrity, always striving to provide you with a high level of ethical service. For things that are really important to them, people value the services of an expert. Planning for financial security is no exception. Professional guidance can help you achieve your goals of financial security and continued growth. To help clients achieve their objectives, John Battaglia works to serve as a friend and an advocate. Working in the best interests of his clients is John's business, and he takes this role very seriously. Whether you are planning for your own financial needs or those of your family or your business, John Battaglia can help you find the right answers. Contact John today to request a comprehensive planning review . . . a simple step that may have an enormous impact on your financial well-being for years to come. Northwestern Mutual is the marketing name for The Northwestern Mutual Life Insurance Company, Milwaukee, WI (NM) (life and disability insurance, annuities, and life insurance with long-term care benefits) and its subsidiaries. John S Battaglia is a Representative of Northwestern Mutual Wealth Management Company®, (NMWMC) Milwaukee, WI (fiduciary and fee-based financial planning services), a subsidiary of NM and federal savings bank. All NMWMC products and services are offered only by properly credentialed Representatives who operate from agency offices of NMWMC. Representative is an Insurance Agent of NM, and Northwestern Long Term Care Insurance Company, Milwaukee, WI, (long-term care insurance), a subsidiary of NM, and a Registered Representative of Northwestern Mutual Investment Services, LLC (NMIS) (securities), a subsidiary of NM, broker-dealer, registered investment adviser and member FINRA (www.finra.org) and SIPC (www.sipc.org). John S Battaglia is primarily licensed in Louisiana and may be licensed in other states.